The acclimatisation and trek were excellent. This was my first trek and my first time in South America and first time travelling on my own! A fantastic experience and well organised! Our itinerary was very well organised and standard of accommodation excellent - particularly the lodges on our trek, which were quite outstanding in every way. A fantastic trek and holiday - all organisation went smoothly - Peru is a fabulous country - the trek and lodges were outstanding. This trip had everything: the spectacular scenery of the trek through the mountains and the luxury accommodation and service we received throughout the holiday. The holiday was a great experience. The accommodation at 'Mountain Lodges' is exceptional and made a great end to each day. The trip was brilliant, I loved it all. The Sacred Valley was an unexpected delight, the trek was just heaven, especially the Emerald Lake and Salkantay Pass, and the trip to Puno and Lake Titicaca was another delightful contrast. I feel very lucky to have had the opportunity for such a wonderful experience - thank you for making it possible in such comfort! Mountain Kingdoms was the first British company to offer this Trans-Andean lodge-to-lodge trek. This alternative Machu Picchu trek, which crosses a high mountain pass between the snow covered Andean peaks of Salkantay and Tucarhuay, shares all of the beauty of the classic Inca Trail but has the added comfort of superb lodge accommodation. The four delightful lodges we stay at are all scenically situated with great views, wood burning stoves, jacuzzis and stylish guest rooms with attached bathrooms and constant hot water. After time sightseeing and acclimatising in the Sacred Valley, and Cuzco, we start trekking to our first lodge beneath Mount Salkantay. Over the next five days we trek via the Apacheta Pass, 4,650m/15,256ft, and the Santa Theresa valley along trails through a glorious landscape of snowcapped peaks and lush forest. After our first unique on trek view of Machu Picchu, we’ll explore the amazing ruins themselves before returning to Cuzco. We can also offer this Luxury Lodges to Machu Picchu Peruvien holiday as a private departure. Prices vary by season but start from £4,085. International flights are available from £750. Contact the office for further details or to book your private departure. Throughout your trek you will stay in wonderful mountain lodges. Your first lodge is located in the high Andean Valley of Soraypampa. It offers 12 comfortable heated guest rooms with lovely mountain views, plump duvets and attached bathrooms. There is a comfortable sitting room with a wood burning stove, a bar, a spacious dining room and a jacuzzi with views of the south face of Salkantay. The other three lodges are located at strategic points along the route and are smaller but no less welcoming and comfortable. Each of these lodges has 6 en-suite rooms, comfortable sitting and dining rooms, wood burning stoves and jacuzzis. The lodges are staffed by local people and they will really look after you superbly. Fly to Cuzco. Drive to the Sacred Valley. Sightseeing and acclimatisation walks in Cuzco and the Sacred Valley. Drive Cuzco to Challacancha, visit farmhouse en route. Trek to Soray Pampa. Local walks at Soray Pampa. Trek from Soray Pampa to Huayrac Machay, crossing the Salkantay pass. Trek from Huayrac Machay to Colpa Pampa. Trek from Colpa Pampa to Lucma Bamba (includes a short bus ride). Trek from Lucma over Llactapata Pass to ‘Hidroelectrica’. Train to Aguas Calientes. Tour of Machu Picchu. Train to Cuzco. Morning in Cuzco. Fly to London. Day 2 - Arrive Cuzco, 3,353m/11,000ft. 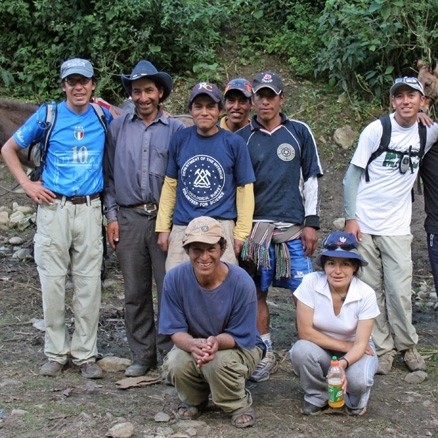 Group transfer to hotel in the Sacred Valley, 2,800m/9,200ft. On arrival in Cuzco, you will be met and will then head off to your accommodation in the Sacred Valley near the small town of Urubamba, situated at a comfortably lower altitude than Cuzco. You may have lunch en route or at the hotel itself. You will stay the night at the Villa Urubamba, which is a pleasant, quiet hotel with comfortable rooms and pretty gardens and good mountain views. Your acclimatisation trek today combines big views, Inca ruins, ancient towns, local farming techniques and pre-Inca salt pans with an easy descent to the valley below. You will start the day with a visit to the small town of Chinchero with its large church and extensive Inca ruins. Chinchero's attractive church is built within the Inca ruins and has a beautifully painted rustic wooden ceiling and decorated walls. The full extent of Chinchero's Inca terraces and its fine stonework are only now being gradually uncovered and restored. Chinchero is famous for its intricate woollen weavings and there is a market for local handicrafts. You then head out across the grassy plain to the extraordinary Inca earthworks of Moray. There is no other Inca site quite like Moray - three crater-like depressions are lined with a series of concentric circular terraces disappearing down into the earth. Some think that this may have been the site of sophisticated Inca agricultural experiments with each terrace representing an altitude zone. It is thought that the terraces' containing walls were filled with fertile earth and watered by complex irrigation systems, which enabled the Incas to grow more than 250 plant species. You will have a picnic lunch at Moray. From Moray you then follow an old mule trail the short distance to the ancient town of Maras with its vast church and outstanding colonial Spanish door arches. Maras was formerly famous for its spies - due to its strategic location above the Sacred Valley the local inhabitants were able to keep track of the movement of all travellers in and out of the valley. From Maras, you will walk back down into the Sacred Valley, a descent of just a couple of hours. En route you will walk through the shimmering terraced salt-pans of Salinas where salt has been harvested since pre-Inca times. The salt pans cover the whole hillside and in sunny weather you will be dazzled by the white of the pools. You then descend into the Urubamba valley where you will meet your transport to return to your hotel. Day 4 - Sacred Valley sightseeing and drive back to Cuzco. After breakfast you will have time to explore further the famous Sacred Valley of the Incas. This is a really beautiful valley and was the breadbasket of the Inca Empire. High above the valley snow peaks glisten in the sun while in the fertile fields below local people harvest crops such as maize, quinoa and many kinds of potatoes. Everywhere there is evidence of earlier Inca settlement with a host of terraces, walls, temples and burial towers in varying states of repair. Firstly you will visit the major Inca temple/fortress of Ollantaytambo at the western end of the Sacred Valley. This amazing edifice was probably built by the great Inca ruler, Pachacuti in the 1460s and it was here that in 1536 Manco Inca temporarily halted the advance of Hernando Pizzaro. The fortress and town represent some of the best of Inca architecture and construction, with fine examples of beautifully carved polygonal stones and monumental, monolithic rocks. Large worked blocks, some weighing as much as 100 tons, were quarried from a site more than a thousand vertical feet above the valley floor using a technique of pecking with hammer stones, then moved down and across the Urubamba River, several kilometres to the temple site. Inclined ramps were built to raise the blocks several hundred feet up hill to the construction area. At ground level below the fortress there are smaller scale ceremonial stonework constructions - here rivulets bubble along cut channels and water tumbles into pools over finely carved rocks. You will then travel to Pisac which lies at the eastern end of the Sacred Valley. Here, situated above the town of Pisac, is found an extensive and impressive Inca hill top complex clinging to the mountain top. You will have time to explore on foot for an hour or two with time to take in the best of the ruins and to enjoy the superb scenery. You will have lunch in, or near Pisac and will also have time to visit its interesting artisan market to check out the souvenir shopping. Ask you guide to show you the guinea pig 'castle' located in one of the town's bakeries! From Pisac it is then a relatively short drive out of the Sacred Valley, over the top and down into Cuzco City where you will check in to your hotel. Cuzco is a beautiful and vibrant City. Formerly the capital of the extensive Inca Empire, today the foundations and walls of Inca buildings are overlaid by Spanish architecture. Fine Inca stonework has survived centuries of both earthquakes and Spanish colonialism. Wanderlust readers have repeatedly voted Cuzco one of their favourite of all worldwide destinations. Your hotel is located in the attractive San Blas area of Cuzco, formerly the artisans' quarter and located not far from the attractive Plaza de Armas with its Baroque Cathedral and fine colonial buildings. There are plenty of excellent little cafés on the main square and in nearby streets, some with balconies overlooking gardens, fountains and cobbled streets. Later you will have the choice of eating in one of the many fine restaurants in the area where really excellent food from a wide range of national cuisines is available. You may find you have the added bonus of sitting alongside a finely worked Inca wall while you eat your dinner. Day 5 - Sightseeing in and around Cuzco. beautiful grass amphitheatre. Once the scene of fierce battles it now hosts traditional Inca ceremonies such as Inti Raymi and Warachikuy. You will then go to the Inca water temple of Tambo Machay lying at 3,700m/12,000ft, followed by a special picnic lunch. From here it is all downhill to Cuzco, stopping at the Temple of the Moon and, depending on time, other historical sites along the way. Once back in Cuzco you can enjoy a bit of relaxation or do some sightseeing around Cuzco. Whether your interest is exploring Inca ruins, visiting colonial churches, bargain-hunting in Indian markets, or just relaxing over a cappuccino on a terrace overlooking the Plaza de Armas, Cuzco has it all. It is a beautiful and vibrant city. Formerly the capital of the extensive Inca Empire, today the foundations and walls of Inca buildings are overlaid by Spanish architecture. Fine Inca stonework has survived centuries of both earthquakes and Spanish colonialism. Readers of Wanderlust magazine have repeatedly voted Cuzco one of their favourite of all worldwide destinations. Day 6 - Drive Cuzco to Mollepata, visit farmhouse. Continue to Challacancha to start trek. Trek to Soray Pampa, 3,850m/12,705ft – 3 hours. After an early breakfast, your Mountain Lodges of Peru tour guide and driver will pick you up at your hotel in Cuzco. The first stop will be a visit to the Quillarumiyoc archaeological site. Next, you will stop in the mountain village of Mollepata. There you will visit El Pedregal, a beautiful farmhouse where you can learn about local agriculture and livestock. Then, the transfer will take you through a winding mountain road to a site called Challacancha. Here you will begin your hike to Soray Pampa along a picturesque path called the "Camino Real" (Royal Path), which is also a good opportunity to acclimate to the higher altitude. As you round the final turn of the Camino Real, the Salkantay Lodge will come into view. Note: Although we highly recommend participating in the hike as part of your continued altitude acclimatization, guests may opt out and continue by transport to Salkantay Lodge. Day 7 - Local walks at Soray Pampa. Today will be a day for exploration and acclimatisation and free time to enjoy this high mountain region. A recommended activity, both for a lovely walk and to aid good acclimatisation, is to make the ascent up to a beautiful lake at 4,100m/13,452ft beneath the snow face of Humantay mountain (many maps incorrectly label this as Tucarhuay). You will be able to have a leisurely start to the day and enjoy breakfast before setting off at about 9am. You walk toward the head of the valley for a short way before climbing up to reach the lake, a steady climb of a couple of hours in all - a bit of a huff and puff, but you will not be in a hurry so can take your time. At the lake you will have time to enjoy the views and may also walk round to where the glacier descends right down to the water. You may be invited to take a dip in the lake, but be warned that the water is quite exceptionally cold. It is then about an hour's descent back to the lodge for a good lunch. In the afternoon you may again enjoy an al fresco soak in the hot tub or take a walk in the surrounding area to look at birds. In the evening the barman at the lodge may lay on a demonstration of pisco sour making and will give you the chance to try out your own cocktail making skills. At dinner your guide will brief you on the itinerary for the next four days. Day 8 - Trek from Soray Pampa to Huayrac Machay, 3,924m/12,874ft, crossing the Salkantay Pass - 6-7 hours. This is the big walking day! You will enjoy a good breakfast before bidding farewell to the lodge staff and setting off on your walk. From this point you will have your own cooks and pony men travelling with you as well as a riding horse in case you tire along the way. Leaving the lodge you hike up beside the Rio Blanco River towards the head of the valley. Along the way you will sign the book so the authorities can check that you exit safely at the other end of the route. You then ascend alongside a stream, up to Salkantay Pampa, 4,164m/13,661ft, which will provide a welcome opportunity to rest for a moment. From here your trail continues up zigzags and then descends a short way to another meadow near a small lake, Soyroccocha at 4,489m/14,728ft. Then it is a just a final 40 minutes up more zigzags to arrive finally at the Salkantay Pass at 4,650m/15,256ft. The ascent is about 4 hours in all. At the pass you may pause for photographs and to take in views of the snow-capped peaks of the Vilcabamba Range in every direction, with the south face of Salkantay towering above you. Also keep a look out for Andean condors, six of which are known to live in this valley. You then continue your descent toward Huayrac Lodge, 'the place where the wind lives', your destination for the evening. You will be served a hot lunch en route, probably at Ichupata, an alpine pasture named after the coarse grass which is a feature of this altitude. On the way look out for granite rocks covered in bright red lichen. On arrival at Huayrac Machay, 3,924m/12,874ft, you will again be warmly greeted by the lodge staff and they will probably take your boots away to give them a clean! You will get used to being a little spoiled. Tea will be served on arrival and you will again have the opportunity to soak in the hot tub. Now that you have crossed your pass and descended a little you may feel that you can indulge in a pisco sour, a beer or a glass of wine here. Day 9 - Trek from Huayrac Machay to Colpa Pampa, 2,844m/9372ft - 3-4 hours. You will wake up to spectacular views of the surrounding mountain scenery including Humantay, a beautiful pointed peak of around 5,790m/19,000ft. Alpacas, pigs, horses and mules all graze together in the meadows around the lodge. Following the long day yesterday you can enjoy a leisurely breakfast here. After breakfast you hike downhill above the Salkantay River, through increasingly verdant scenery. There could not be more of a contrast to yesterday's scenery - you soon leave the stark Alpine scenery and walk instead through beautiful lush jungle. You will see tall pampas grasses, creepers worthy of Tarzan, bright orchids and clouds of butterflies flitting amongst the flowers and trees. You also pass by several picturesque settlements. This is a really beautiful walk and as it only takes about 3 or 4 hours you can really take the time to enjoy it. You are now low enough down to encounter occasional biting insects so have the insect repellent handy. After about 3 hours descent you will see below you, on the other side of the river, the thatched roofs of your lodge. As a bit of a sting in the tail to this walk you descend to the river, cross a bridge and then have to climb, but only for about 10 minutes, to the lodge. Colpa Lodge is located in a beautiful situation on an open promontory at the confluence of three rivers, which here join to form the Santa Theresa River. There is a grassy area in front of the lodge and the hot tub is built so that when you are sitting in it you can enjoy the lovely views over to the village of Colcapampa below. You will have lunch at the lodge which may well be a traditional Andean 'pachamanca' - this meal is cooked in a hole in the ground on hot stones and will be prepared for you by your cooks. The afternoon will be free to enjoy the lovely surroundings or relax in the hot tub. Day 10 - Trek from Colpa Pampa to Lucma Bamba, 2,150m/7,095 ft (includes a short bus ride) - 4-6 hours. After another good breakfast you head off again. You descend down river to the left of the lodge, down to the river near the hot springs near Colcabamba and cross the Santa Theresa River. Your trail then takes you down alongside this beautiful river through more forest and past the occasional settlement cleared from the surrounding rainforest. You stop near the river for a hot lunch and then after lunch descend further to arrive at a road. As nowadays horses are not allowed on the next part of the trail you will say "goodbye" to your horseman and riding horse here - porters will carry the luggage for the last section. A bus will be waiting for you at the road, your staff will load the luggage and you will then drive the short distance to the start of the Camino Llactapata (The Llactapata Inca Trail) just beyond the village of La Playa. This ancient trail which links the Santa Theresa Valley with the Inca ruins at Llactapata and the Aobamba valley has been recently beautifully restored and, like the more traditional Inca Trail, no mules or horses are allowed to travel it. From the entrance gate it is a lovely walk up a well-made trail through coffee plantations - all the coffee in this area is grown organically and is said to be of very high quality. You then follow round an open hillside, with more great views, to reach the Lucma lodge about 30-40 minutes from the road. The lodge is situated near Lucmabamba Village amongst coffee and avocado trees. You will be able to relax here at lower, warmer altitudes. Day 11 - Trek from Lucma over Llactapata Pass, 2,800m/9,186ft, to ‘Hidroelectrica’ - 5-6 hours. Train to Aguas Calientes, 1,900m /6,270ft. After a fairly early start and a hearty breakfast, you say farewell to the lodge staff and set off on the last trekking day of your trip. You have another beautiful walk today with your first views of Machu Picchu. Heading uphill from the lodge you leave the coffee plantations and farmland and climb round a more open hillside with fine views back up the valley of the Santa Theresa and snow-capped peaks in the distance. You head uphill for about two to two and a half hours, occasionally passing through cool, mossy, lichen hung glades to reach the top of the ridge. Near the top of the climb are some fine Inca stone steps. At the very top, at 2,800m/9,186ft, you are in forest so there are no views from there, however after descending for about 10 minutes you may glimpse your first view of Machu Picchu through the trees on your left. In any case after a further 10 minutes descent you arrive at the Inca ruins of Llactapata from where you look directly across to a stunning view of Machu Picchu from the south west, an angle that few other tourists ever see. Hugh Thomson and Gary Ziegler investigated the ruins of Llactapata in 2003 and discovered more than 80 buildings. They concluded that what appears to be one of the most important buildings there is directly aligned to the ceremonial centre of Machu Picchu and that at the all-important June solstice the sun is seen to rise directly over Machu Picchu from this spot. Possibly Llactapata was a sister site to Machu Picchu, or was a ceremonial offshoot of Machu Picchu. In any case there are still many unexcavated ruins all around, swallowed up in the luxuriant jungle. Lunch will be served at a scenic viewpoint, looking out to Machu Picchu. From Llactapata you begin your final descent, down to the Aobamba River, through lush bamboo forests and more orchards and coffee plantations (approximately 2 hours descent). You cross a bridge over the Aobamba and then walk down to join the Vilcanota River, passing a tumbling 500ft high waterfall, part of the hydroelectric scheme, and then continue the short distance to the tiny railway station of 'Hidroelectrica'. There will probably be time for a celebratory beer here in a small local café before you board the late afternoon train for the short, scenic train ride to Machu Picchu Pueblo (formerly known as Aguas Calientes). Day 12 - Tour of Machu Picchu. Train to Cuzco. After an early breakfast you will drive the short distance up the zigzag road to Machu Picchu to get there before the main crowds and also when the light is better for those all-important photos. Machu Picchu is a place that really lives up to all expectations. The setting is breathtaking and the ruins themselves are sensational. If you wish to climb Huayna Picchu the cost of the permit for this is included in the price of your trip, but please let us know in advance if you wish to climb it because nowadays only a limited amount of people are allowed to climb the peak each day. If you would prefer to climb Machu Picchu peak instead on this day please let us know well in advance so that we can change the permit to this peak instead of Huayna Picchu. You will in any case have a full guided tour of the ruins with time beforehand to walk out to the Inca Bridge, or just wander through the ruins revelling in the amazing atmosphere of this fabulous place. You will then descend to Machu Picchu Pueblo to board the afternoon train back along the Urubamba Valley, a really great train journey. You will alight from the train at Ollantaytambo and your waiting bus will speed you back to Cuzco and your friendly hotel. You will then have time for a final meal out in Cuzco. Day 13 - Morning at leisure in Cuzco. Group transfer to airport for flight to London. You will have the morning free in Cuzco until it is time for you to transfer to the airport for your flight back to London. A fabulous trekking experience moving from glaciers to jungle in only a few days. Not only beautiful scenery but excellent lodges with lovely meals and high degree of comfort. Juan was an excellent guide with an extensive knowledge of the area. Mountain Lodges of Peru were truly excellent. This trekking holiday has to be the best kept secret in your catalogue. The trekking was demanding, the views magnificent and the lodges and meals were exceptional. The local guides were perfect and couldn’t do enough for us! The organisation was spot on from start to finish. The mountain lodges were excellent and the guides, particularly for the trek, were fantastic. All food was of a very high standard and the staff everywhere were friendly and helpful. Everything was extremely well organised and we were taken care of superbly. The itinerary was perfect and the acclimatisation program in the Sacred Valley was an excellent idea. The balance between guided tours and free time was just right.... We couldn't have wished for a better holiday.